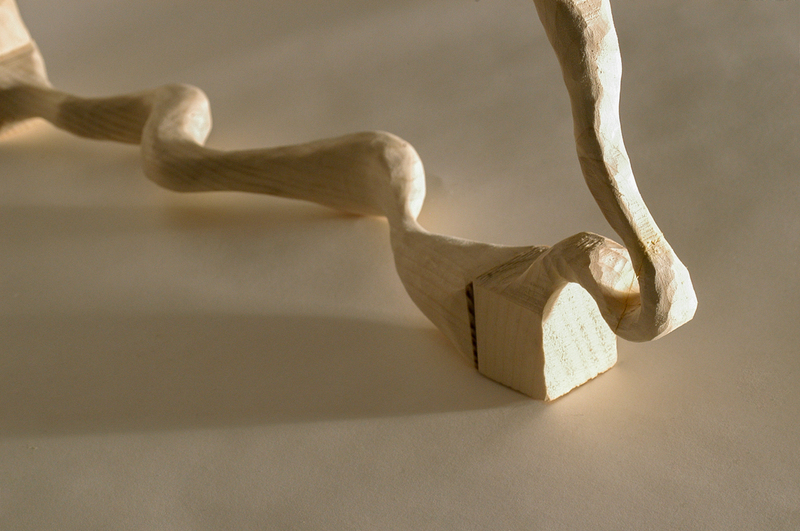 A study in dimensionality, materials, craft, and designing back and forth between the digital and physical worlds. This was, at heart, semester-long exploration of the design process and how to move nimbly across the barriers between physical and digital, “model” and “finished”. 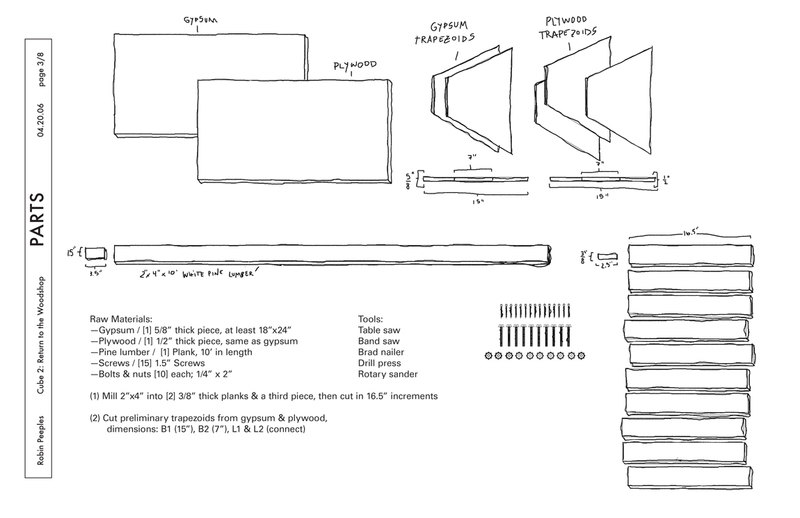 In the first assignment, we were asked to design a 16″ cube in 3d modeling software (Vectorworks) that we would then build using only pine 2x4s and mechanical fasteners (no glue). In the second, the instructions were the same but with the added requirement that we incorporate gypsum board (drywall) and plywood sheeting as “skin” on exactly 5 of the cube’s sides. 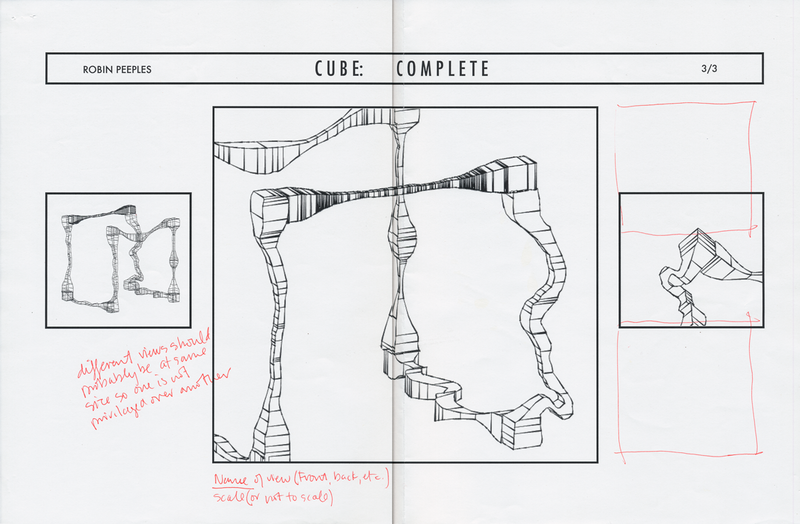 My design for the first cube began as a relatively simple shape that was to be a modular system connected with dowels, allowing it to be reassembled in many formations (see the schematic below). When I got to physically modeling that cube, the dowel concept seemed stagnant, and I got the idea to use rare-earth magnets as my connectors. Once I started working with the magnets, I realized that my cube segments needed to be lighter. Much lighter. 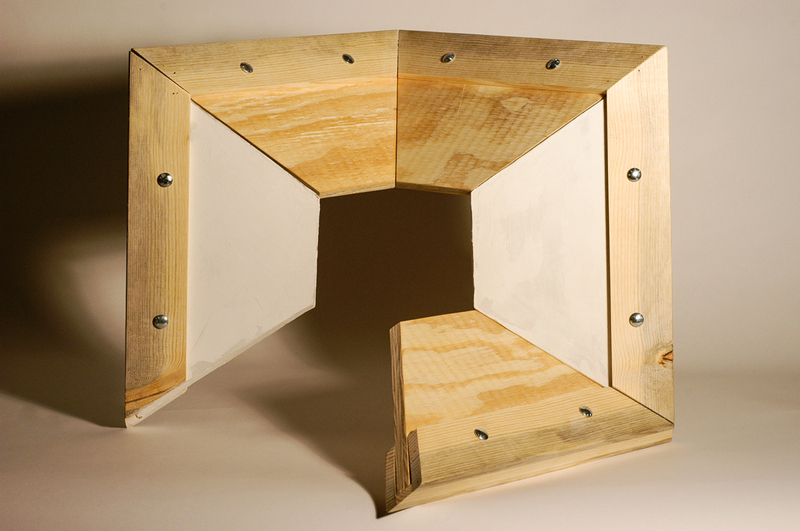 To reduce weight, I sculpted each section of the cube on a drum sander, according to the wood’s own inclinations. 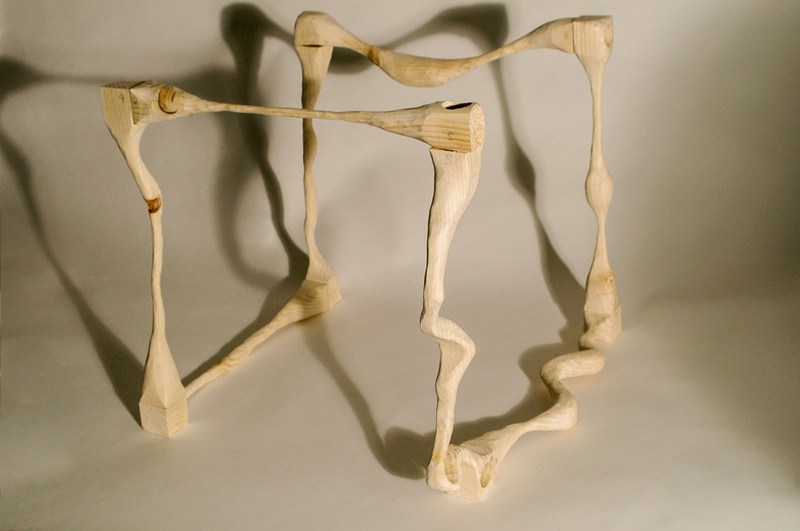 Where the wood was soft, I sanded it away, and where it was knotty or tough, I let it be. 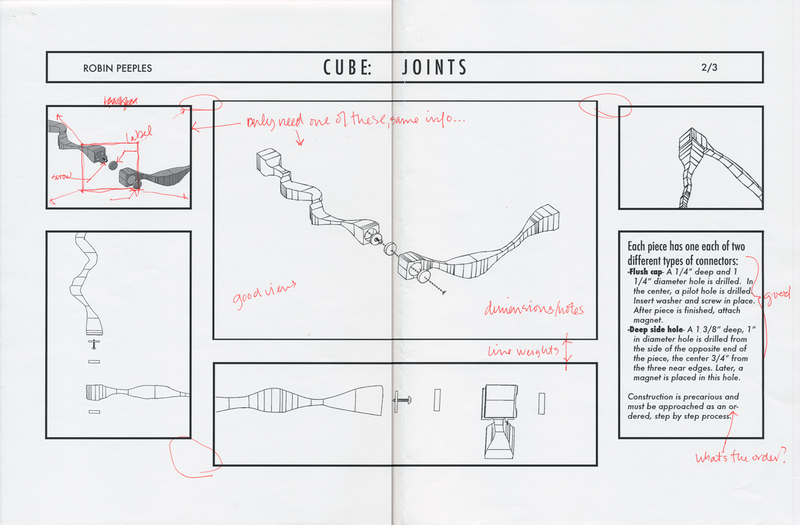 This allowed me to reveal unexpected, sinewy forms and turned the cube’s whole character from geometric and precise (like the digital rendering) to organic and complex. As a final step, my digital renderings had to match my finished piece. 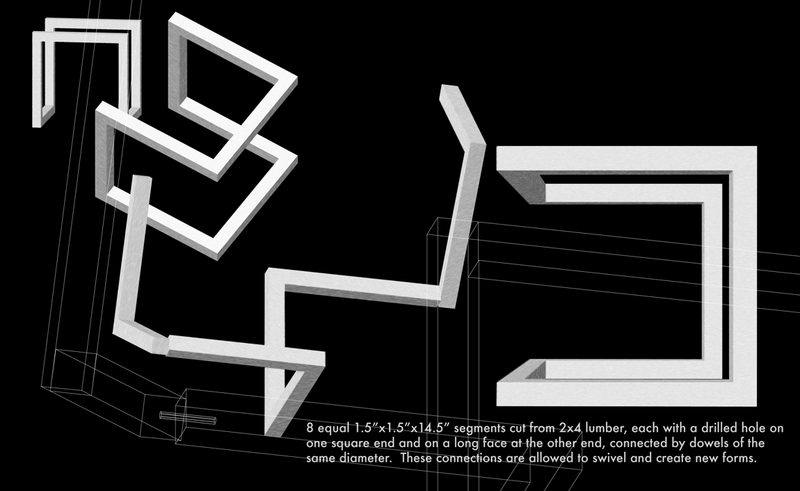 Modeling these shapes in Vectorworks was laborious and involved scanning each face of each segment. Our presentation panels were required to show both the finished piece, and attempt to serve as a construction guide. 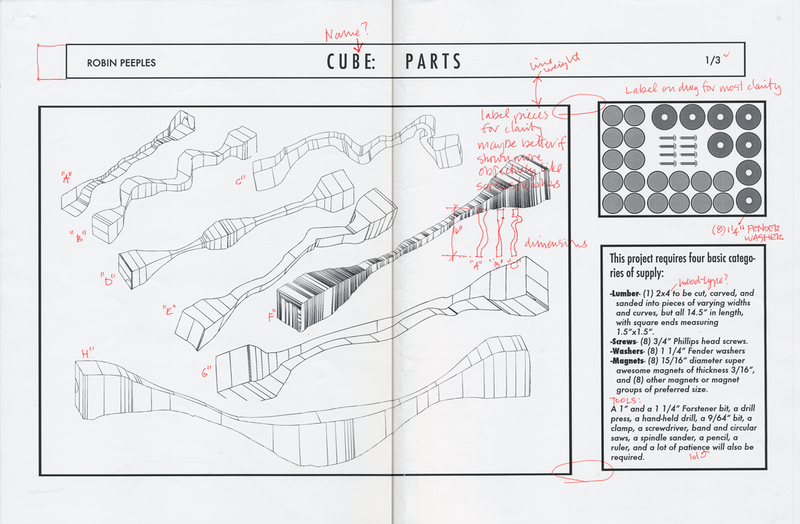 For the second cube, the addition of “skinning” materials was tantamount to the addition of a whole dimension. 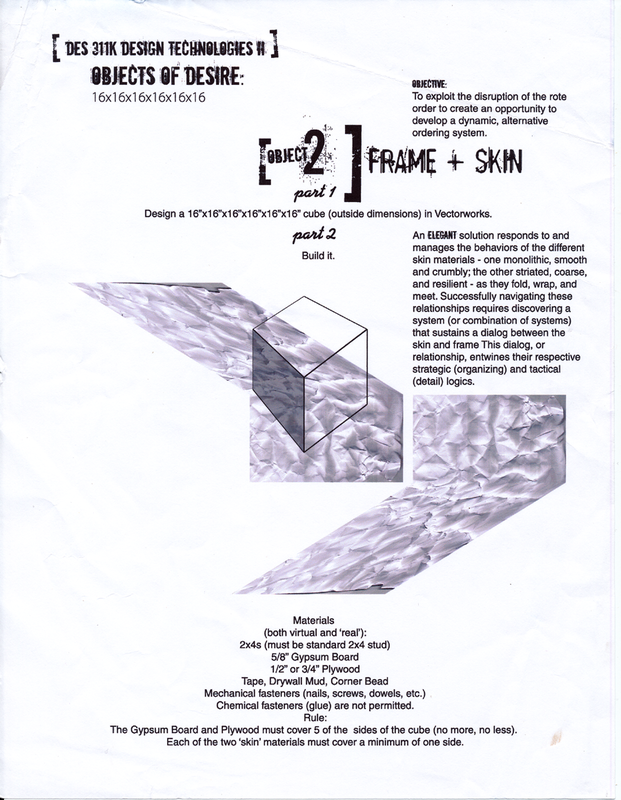 (The 2×4 is ultimately a framing material; it outlines, and lines are 1 dimensional. 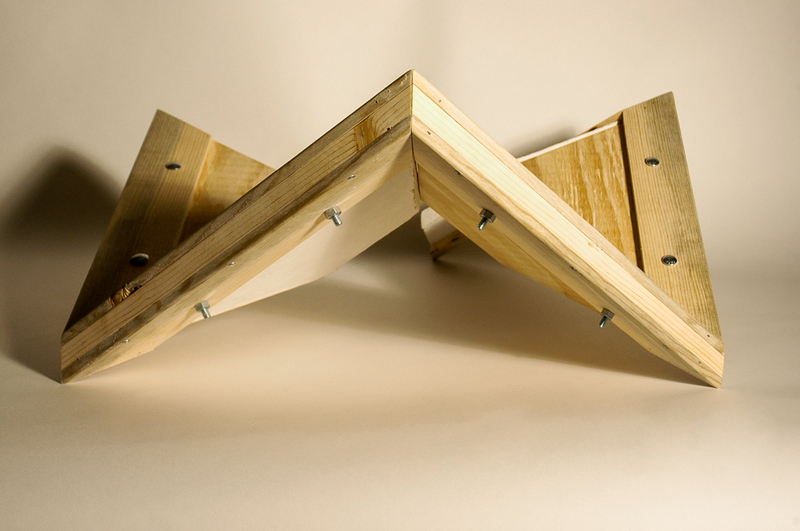 Gyp board and plywood are planar materials, and planes are 2 dimensional.) So I wanted to add a dimension to my cube. A hypercube or tesseract can be thought of as a four dimensional cube. Where a line segment is bounded by 2 points, a square is bounded by 4 line segments, and a cube is bounded by 6 squares, a tesseract is bounded by 8 cubes and occupies 8 times the volume of a 3 dimesional cube bounded by the same side length. 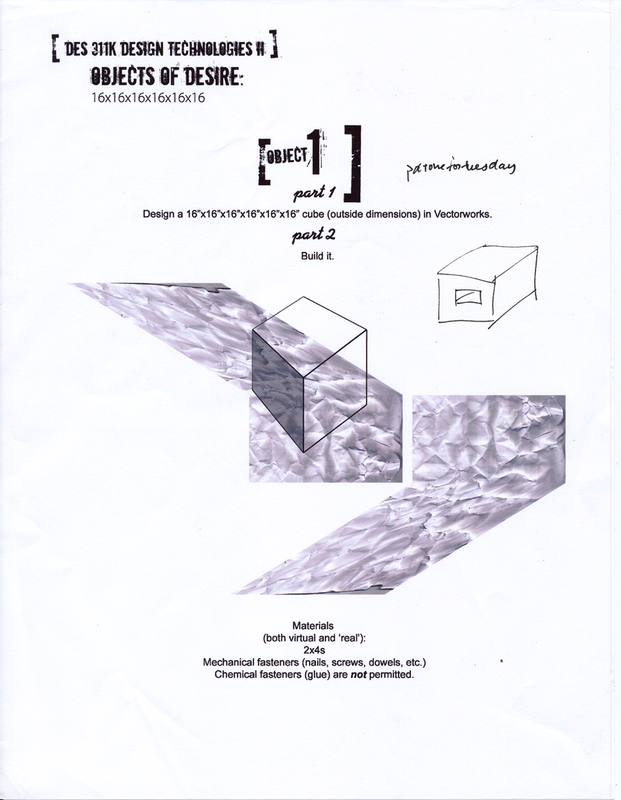 It is often represented as a small cube centered inside a large cube with their analogous corners connected. In such a visualization, you can see the outside cube, the inside cube, and one cube (in this form they look like trapezoidal pyramids) connecting each of the 6 analogous square faces — 8 total cubes. 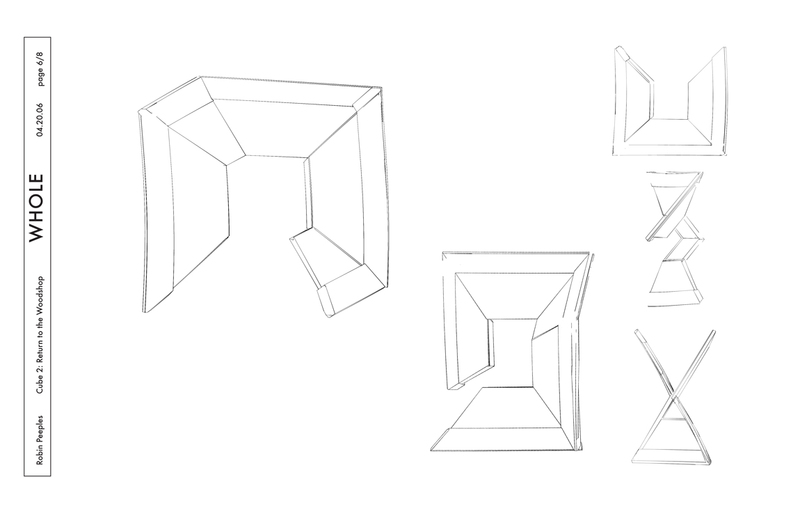 In my piece, I wanted to modify this representation to highlight each of the 8 cubes while also expressing their interdendence — each cannot exist without the others. 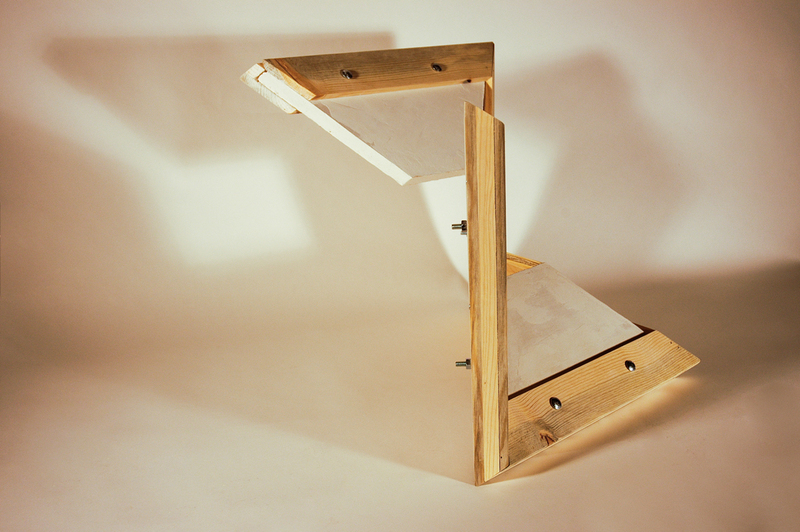 My first model achieved these goals, but it was cumbersome, clunky, unintuitive, and required too many materials. 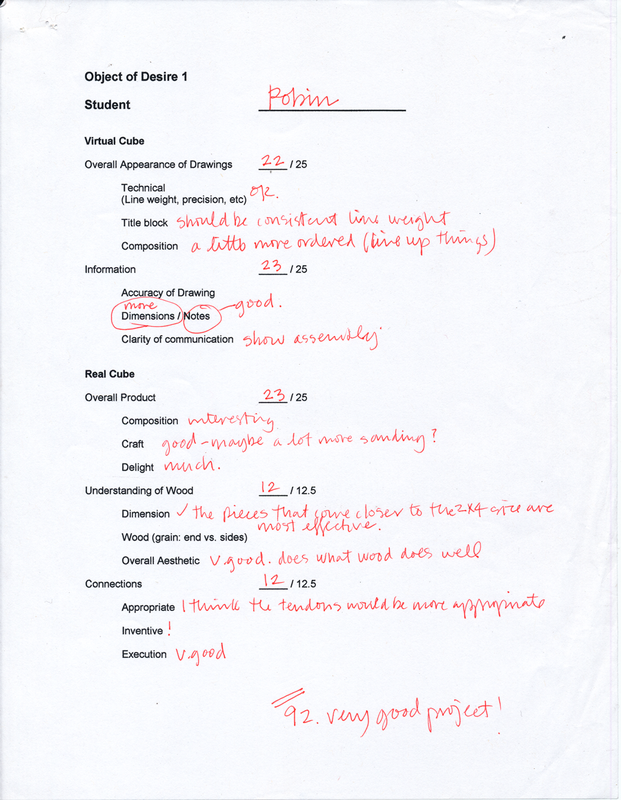 It also relied on movement, the ability to open and close, and I knew (after my professor nudged) that a better solution would be one that showed movement even while it was still. My next model achieved all of my conceptual aims much more elegantly, but left a lot of complex geometry and construction questions open in its wake. I experimented a lot and made many models, some at-size, to figure out proper proportions and elegant assembly techniques. 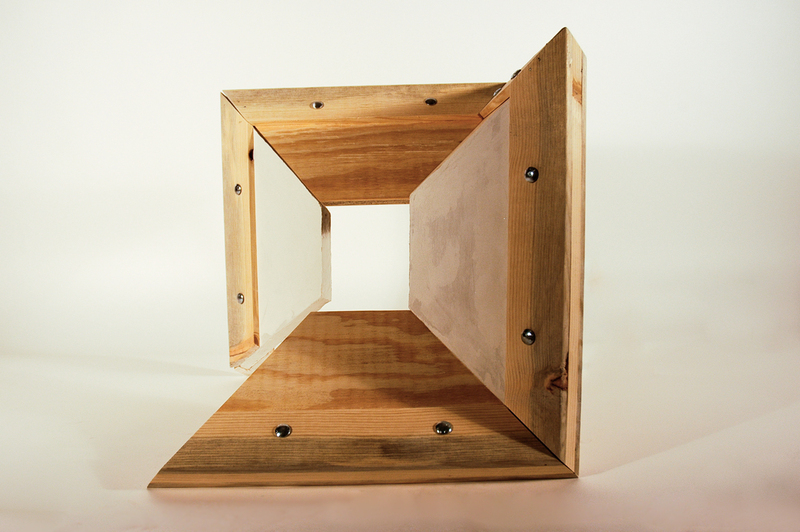 The outside pine frame of the finished piece consists of a single 2×4 wrapping around the form, with the grain uninterrupted. Disclaimer: I’m not a mathematician. I appropriate concepts and redeploy them in strange places, and I’m pretty ok with distorting those concepts a little. That said, if you want to drop some knowledge on me about hypercubes, I’m all for it.